As photographers and artists, isn’t the ultimate thrill actually getting down to work on our art? Of course, running an arts and crafts business involves so many less-fun tasks. Among other things, we need to figure out how we want to use our artwork and how best to sell it. One way I sell my artwork is as greeting cards. The margin on cards isn’t large, but there’s an established market, and if you can tap into that the volume of sales adds up. I sell some of my cards online directly on my Artfire Gallery and I also wholesale them to brick and mortar stores through my super greeting card sales-rep, Tamara Holland – who I must tell you just became the very first “Artist of the Month” at Calypso Cards, the company that distributes one of her lines of awesome cards. As I take new photos and create designs from them, I select the ones I think are the best and most suited for cards. Then, when it’s time to re-order my best sellers from the printer, I add a few new ones. Without further ado, here are my five new greeting cards! First, my straight photo of a monarch butterfly sipping nectar from a zinnia flower. Second is a photo of a Julia butterfly, also on a zinnia. I worked with drawing and other image tools for a vintage feeling. Next, two new hummingbird cards. I have several hummer cards in my line, but these are different, especially the one on the right, a hummingbird at an abutilon flower. I used several paint and other tools to emphasize the bright colors and the bird’s wings. I also worked to bring out the vivid, saturated colors of the image on the left, a hummingbird at Mexican salvia (sage). Finally, I included a painterly rendition of my photo of an egret soaring over a pond at the Oakland Museum. After the hard work of making the new designs, it’s such a thrill to open the box filled with the printed cards. I’ve told you before about the local printer who I am so lucky to have printing my card line. Jayne and Bud at Cerrito Printing came through again, big time, for this latest order. 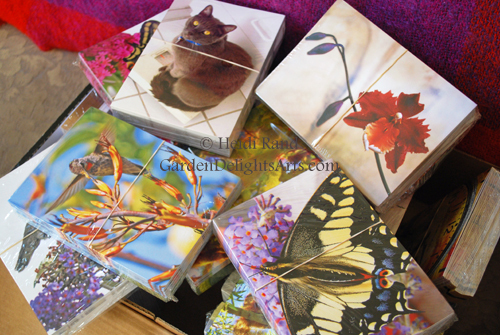 Do you sell your art as greeting cards? Many artists who sell at shows feel that offering cards cuts down on their sales of prints, although others think it’s worth it because a lot of people who would never buy a print will pay a few dollars for a card. What do you think? 1. Local printers: People often assume that online printers will have lower prices than local print shops, but that’s just not true. For one thing, remember that you don’t need to pay shipping when you use a local printer. Also, if you’re selling your work you should have a reseale tax number, provide that to the printer so they don’t charge you tax. In addition, local printers will likely offer more flexibility and personal contact than online services. Ask them what you can do to keep your expenses down, such as use different weight paper, order more cards or posters to bring the price per print down, batch your prints or cards onto a large sheet that you (or they) will cut to size, etc. Find out whether they are charging you for any part of the workflow that you can learn to do yourself, such as file-setup. Make a list of all of the printers in your area. Get estimates from each of them to compare prices. If you like one that charges slightly more, ask whether they will meet a competitor’s price. I wrote a post last year about my wonderful experience having my greeting card line produced by a local printer, Cerrito Printing. 2. Costco: I’ve spent a lot of time in online forums with professional photographers. A surprising number of them have the work that they sell printed by Costco, which generally has very competitive prices. Get to know the people who work at the printing division of your local Costco, and ask them about getting the best quality from your order. 3. Copy shops: see whether you can get a quality print at a copy shop, rather than a printer. The prices will likely be much lower. If the inks or paper they use aren’t archival, however, don’t misrepresent the quality of the print. Generally your prices for work that is not archival should be significantly less than when you’re using archival materials. 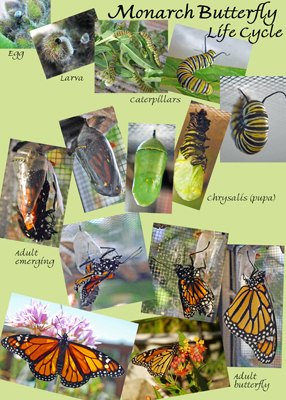 I had this Monarch butterfly life cycle poster printed at a copy shop. 4. Online printers: Again, make a list of several online printers and compare prices. Remember to add in shipping charges, which vary widely. Plan far enough ahead so that you can select the slowest, least expensive shipping option. Search online for coupons for discounts or free shipping, and subscribe to their newsletters or Facebook business pages to get special offers. If an online printer has a brick and mortar store nearby, find out whether they will let you pick up in person to avoid the shipping charge. When ordering from an online printer that does business in your state, they will charge you sales tax, so before you order make sure they will let you scan and email your tax resale certificate. Finally, figure out whether you really need to get prints made. Are you selling online? If so, you should be printing on demand when you have an order, rather than spending money up front for things that may not sell. If you’re planning to sell at craft shows, or trying to place your work in a gallery or store, figure out what you can realistically sell before ordering prints. Do you have any other tips about how to save money on prints?